Every ones favorite wide leg trouser, a beautiful mid-weight polyester crepe trouser with a fluid full leg opening, while still flattering the bum and hips. High waist with slash pockets, they feature a side zipper with hook and eye at the waist band, and a blind hem to make tailoring length easier. Trousers are long enough to cover shoes while wearing high heels to give a lean, never ending look to the legs. Model, chelsea, wears a size 2. 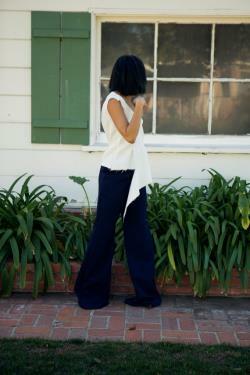 Featured with off-the-shoulder asymmetrical front crepe blousemade of 100% polyester. Machine wash cold and flat dry, use medium iron if necessary, or dry clean. Size 2 waist - 25. Length - 42"size 4 waist - 26". Length - 42.25"size 6 waist - 27.5". Length - 42.5"size 8 waist - 29". Length - 42.75"size 10 waist - 30.5".